When the eyesight gets worse the optometrists prescribe eyeglasses. But before wearing them everyday try yogic eye exercises that existed for centuries and helped millions to get perfect vision back. Here is the short version of yogic eye exercises described in the book of Yogi Ramanantata. Start with massaging your lower eyelids with the tips of your ring fingers. Use short and gentle circular movements. Close your eyes half way down. You will notice that your upper lids constantly tremble with different amplitude. Concentrate your efforts on stopping this trembling. (Little hint – it will be easier to do if you look at further objects). Slowly close your eyes, like your eyelids are made out of puffy cottony clouds. Think that your eyes get extremely comfortable in their position. The blood filled with the oxygen flows through your eye sockets. When you inhale imagine the breezy oxygenized air coming through your nose into the eyes. Exhale through the mouth. Breathe this way for one or two minutes and end this exercise with a smile. Blink. Always remember about the blinking to lubricate your eyes, cleanse them and at the same time relax all of the muscles surrounding your eyes. Sit straight, look to the most left side and hold to stretch your eye muscles. Return your gaze back to look straight in front of you. Blink for a few seconds in order to relax your eyes. Repeat. Blink a few times. This exercise has to be repeated for other eye positions (right, up, bottom, right top corner, right bottom corner, left bottom corner and left top corner). Do not forget about blinking. Draw a circle with your eyes. Blink with your eyes closed. Perform Palming to relax your eyes after Stretching set of Eye Exercises. Spend 2 minutes to give yourself Eye Acupressure Massage to prepare your eyes for the Dynamic Eye Exercises. Sit straight. Look to the most left position and move your gaze to the most right position. Repeat 3 times. Blink a few times. Repeat looking up and down, diagonally (from the left top corner to the right bottom corner and from the top right corner to the left bottom corner). Each movement has to be repeated 3-4 times in the beginning. Do not forget to blink. Perform focusing exercises. Look at the tip of your nose and then on the far object and back to the tip of your nose. Repeat 10 times dynamically. Be inventive. Choose objects on the different distance and look at each of them. Finish up with Palming to relax your eyes. 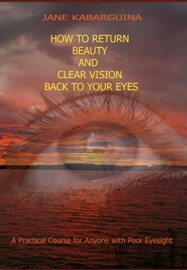 Buy the book "How to Return Beauty and Clear Vision Back to Your Eyes"